Blue John is now a very rare and mysterious gemstone mined around the Peak District village of Castleton, Derbyshire. It is believed that it was the Romans that first discovered the gem some 2000 years ago and instantly fell in love with it's unique qualities. The Blue John mines were first discovered around 1750 in Treak Cliff, just outside Castleton, Blue John very quickly became popular for use as a decorative ornament. Within ten years there were sixteen mines working the area to supply thirty-odd local firms who fashioned it into fireplace and other ornaments for the stately homes of England. Goblets, urns, bowls, obelisks, clocks, paperweights, chalices and pyramids were all created from the distinctive Blue John. No two pieces look totally identical thanks to the colour variations in the stone. It was also used to create decorative stained-glass window panels, an example of which can be seen in Buxton Museum & Art Gallery. The earliest dated example of decorative Blue John from Castleton is from 1762 in Kedleston Hall, near Derby, where there are Blue John panels mounted in a marble fireplace surround designed by Robert Adam. The Blue John love affair lasted until the end of the Victorian era, but by that time whole Peak District industries were dependent on it and so another use needed to be found. It continued to be mined but instead of being used for decorative ornaments it was used as a flux in the steel industry. Today there is very little Blue John waiting to be harvested, and although it is still mined during the winter months in Castleton, only small pieces suitable for jewellery are found. 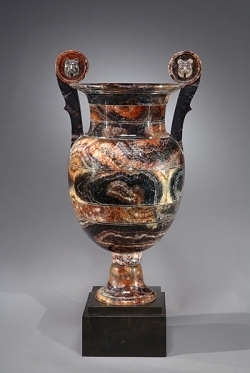 A Blue John vase similar to the two that are now part of the collection of the Duke of Devonshire, Chatsworth House, Derbyshire. Despite its name, Blue John isn't blue in the way that sapphire or turquoise is blue. At best it's purple, but very often the predominant colour is either creamy white or yellow with narrow purple veins or bands, or even no purple at all. Some smaller jewellery pieces may appear more purple/blue than larger items and this is probably due to careful selection of the area of stone that is used. There is some debate over how it came to be called Blue John, with some claiming that the name originated in France, and others that it came from Matthew Boulton, an 18th century engineer and manufacturer/craftsman who pioneered ormolu ornaments and used the stone, which he called blew john, as bases for the ornaments. Which version you get depends on your source of information. The most popular, and most recounted version, is that Blue John is taken from the French Bleu-Jaune (which means Blue-yellow). During the 1770s Blue John was exported to France to have ormolu decorations added and it is believed that it was during this time that the name stuck. 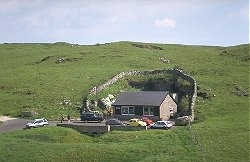 The Blue John Cavern is at the top of the Winnats Pass, a few kilometres west of Castleton, Peak District. 25km from Sheffield, 45km from Manchester. There are very few pieces of Blue John left today and the little that remains is either mined during the Winter months or sorted from the spoil heaps from past mining. No two pieces of Blue John are identical making this a very unique gemstone to possess. Now that you know more of it's origins and history we hope that this has whet your appetite sufficient enough to tempt you into owning a unique piece of Blue John set into sterling silver. Please note: Blue John stones can be semi-translucent. This is a common factor of these stones. It is also a fragile stone and is often combined with a glass dome or cap to ensure the continued integrity of the piece of Blue John and to protect the front of the stone from damage that might otherwise occur. For this reason, all the Blue John sold by Ceirys Designer Jewellery is a slice of Blue John with a glass cap, known as a "couplet". This style of supporting and protecting semi-precious gemstones is used in other stones, such as Opals. At Ceirys we do our best to match Blue John Stones, wherever possible.